Lounging on the swing at the LBH. The LBH has a small cohort of 9th and 10th grade students that we have been working with for the last five years. When some of the students were struggling, Director Carl Foster, along with parents, our staff and social worker, set out to find a school that would help these kids prepare for college and help set them on the path to a successful life post high school. All of the kids worked hard, put in more time and more studying. Those that moved to the new school kept up with the more rigorous curriculum and put in the extra hours. Now, as these students enter high school and near graduation, their sights are on higher education. The kids in our program come from families that qualify for Temporary Aid to Needy Families and other qualifying services. Director Carl Foster has made it our top priority to see these kids get to college. According to research, only 9 out of 100 Hispanic high school graduates enroll in a four-year college or university and of those nine only 2 go on to earn a Graduate or Professional degree (Yosso, 2006). Help us change those statistics. To donate to any of our kids’ college funds, click on the “Donate Now” link to the right and put their name in the memo line. Thank you for helping us break the cycle of poverty and send these kids to college. Jefferson came to the Little Blue House when he was nine years old. When asked who his hero is, he mentions LBH Director Carl Foster, “Because even though I have done a lot of bad stuff, he still supports me, no matter what.” Jefferson has come a long way since first joining the LBH Out-of-School Time program. He spent summers in the LBH Youth Summer Program and worked hard to keep up his grades in his DC Public School. Jefferson’s mom had two years of university before dropping out to have him, so college has been an important goal for both Jefferson and his family. His mother wants him to go to college because many others in his family didn’t have the same opportunities that he has. When asked why someone should invest in his future, he says, “Because I want to make a change and leave a legacy. I don’t want to have a boring career, I want to be able to change the world.” How will he do that? He wants to attend the University of Maryland because of the strong engineering programs there. Jefferson wants to be a mechanical engineer; he likes to fix things and is interested in engines and wants to focus on alternatives to gasoline like electric and solar. We asked Jefferson if there was anyone he’d like to meet, dead or alive, and what he would ask them. He said he’d like to meet Vijaya Lakshmi Pandit. When we asked him why, he said, “She fought for women’s rights, and I want to know how she was able to accomplish this, because she helped out the entire world of women and human rights. Estefany came to the Little Blue House when she was 12, and spoke little to no English. Now 15 and in 10th grade, she considers herself to be someone who works hard to achieve her goals. She likes to act and wants to be a doctor when she grows up. It wasn’t until coming to the Little Blue House and starting at a new college-prep charter middle school that Estefany started talking to her mom about college. Without college, Estefany doesn’t see much of a future for herself. She sees herself working at McDonald’s making minimum wage, a far cry from a medical degree. When asked about why she wants to become a doctor, Estefany says, “I think that it is our duty to help those that need help.” She also said that she’d like to help those that couldn’t afford to see a doctor. 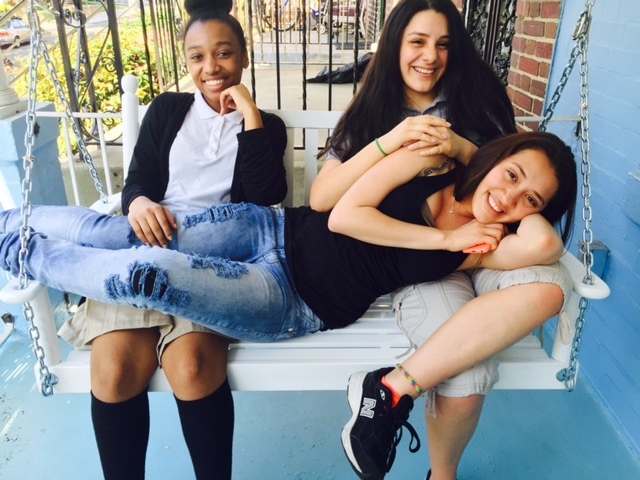 Breianna is sixteen years old and lives in Columbia Heights with her mother and two brothers. She attends Cardozo Education Campus and is a junior. Breianna is very motivated and her goal for this school year is to get all As and Bs on her report card in order to improve her GPA for college. Breianna’s mother is excited to see Breianna graduate and go to college. Her mother did not graduate high school. Breianna’s older brother completed high school, but has not decided on a post secondary path. Breianna is confident that she wants to go away to college, and her family is very excited to see her move on to higher education. Breianna and her family have witnessed many bright children end up on the streets in trouble, and Ms. Velvet does not want that life for her children. Breianna is determined to be different from other people in her neighborhood and go off to college. The college process can be difficult and stressful for any high school student, but can be even more complicated for a first generation college student. Breianna is eager to go away, but is still learning about the process and all of her options, as well as preparing for the SAT. Although her mother is sad to see her go, Breianna wants to go far away for school to explore new places and expand her horizons. Currently she is interested in attending Perdue University, Ohio State University, or Mississippi State. Breianna has always wanted to be a veterinarian and work with animals. She is very interested in how the animal body works, and has always wanted to help animals because they are unable to help themselves. She is currently applying to Perdue University’s summer program for high school students who are aspiring veterinarians. Hopefully in summer 2016 Breianna will spend a week in Indiana, the furthest she has ever been from home, meeting new people and learning about veterinary science. Along with working hard in school Breianna has interned at the Washington D.C Humane Society, and is currently interning with Critical Exposure, a nonprofit organization that teaches students photography, and how to use photography to express themselves, and to use photography to make chance in their schools and communities. Breianna has big dreams and will work hard to see her dreams accomplished. William’s mom never went to college. They didn’t really talk about it and William said that he didn’t put much thought into college saying, “We don’t have the money for it; it’s really expensive.” Like most of the kids who come to the Little Blue House, William comes from a low-income, single-parent family. William started coming to the LBH when he was 9. After attending the Little Blue House Out-of-School Time program and Summer Youth Development program for the last five years, William has done better in school and kept up his grades. William couldn’t imagine his life would be very good without the LBH. “They’ve helped me out with math, and through middle school and now they’re helping out through high school,” he says. William loves to play soccer and counts going to the lake house and playing soccer with other LBH kids as some of his favorite LBH memories. He has aspirations of becoming a professional soccer player, but he knows that even athletes need to have a college education. Where does William see himself in five years? “I see myself being in college, getting ready to graduate and hoping for the best.” He wants to be a psychiatrist when he grows up, so he can help others. What advice would William give to his five year-old self? “Pay attention in school and always listen to people and respect them” We think that’s pretty good advice. Ashley has a long history with the Little Blue House. She first came to what we now call the LBH, but what was once called the Boarder Baby Project, a residence for children. Ashley was nine months old. With the help of the Little Blue House, Ashley was reunited with her birth father and has continued to get support from the staff and Director at the Little Blue House as it transitioned from a residence to a family development center. Now, Ashley is with us as we begin another chapter as a Scholarship Fund. Ashley’s favorite subject in school is English. She wants to attend the University of Maryland or Catholic University mainly because she’s had the opportunity to visit both colleges. Over the years, staff members at the Little Blue House have primarily been students from American and Catholic Universities, the University of Maryland and Howard University. Staff have taken our kids to visit their campuses, providing an opportunity to see what a college campus is like and to interact with other students. Despite not knowing what career path she wants to take, she knows that she wants to help others. Carmen is 16 years old and is a junior at Bell Multicultural High School in Columbia Heights. Carmen has always been very serious about school, and is incredibly interested in learning about college and all the different post secondary options she has. Carmen understands it will be a long rode to her first day at a university, but she is already applying to scholarships and is determined to make her dreams a reality. Currently Carmen is getting all As and Bs in school and is taking three advanced placement classes. She is taking AP Spanish, AP ceramics, and AP English language. Carmen is passionate about education and works hard in school as well as juggling responsibilities at home. Carmen has three younger siblings. As the oldest in her household, she sometimes has to take on extra responsibilities at home. She often watches her younger siblings, and will sometimes prepare dinner; even though she admits her mother’s cooking is much better. In her spare time she enjoys writing fictional stories, and taking photographs. Like many high school students, Carmen is excited to go to college to feel independent and to have a new beginning. She will be the first person in her family to have this opportunity, and she does not take it for granted. Carmen understands how unbelievably lucky she is to be able to go to college. Right now Carmen wants to double major in psychology and photography, but she is also interested in creative writing. In ten years Carmen hopes to have her own psychology practice. She wants to be able to help people and go to school to learn a trade that will help others. Carmen attending college will honor all her parents’ hard work to create a better life for their children, and will make them incredibly proud. Eric is a 16 year old who attends School Without Walls in Northwest D.C. Eric is incredibly bright; often scoring in the top percentiles on state standardized tests, and has big dreams for his future. He enjoys reading science fiction and historical fiction books, but his favorite book is To Kill a Mocking Bird. Although Eric is only a junior in high school, he has often had to act older than his years for his family. Eric, his two younger brothers, and his mother are financially insecure. Eric’s mom never graduated high school and works minimum wage jobs to support her family. As soon as he could, Eric worked in order to help his family. He now works at Chic-Fil-A part time to help out. Along with working, Eric also watches out for his little brothers. He wants to make sure that they stay on the right path and grow up the right way. Graduating high school and going to college is incredibly important to Eric. He is doing everything he can to be a competitive applicant to his dream schools. Currently his dream is to attend Johns Hopkins University and study engineering. He is currently taking two advanced placement classes, and hopes to intern next semester in an engineering lab. Eric is one of the Little Blue House students who frequently asks about college and college life. He was able to go on a college tour at Johns Hopkins and was in awe of the campus and all the facilities a school like Hopkins has to offer. He is very excited to meet people from all over the country at college and hear different perspectives. He also is excited to meet professors and learn from their experiences. At the end of the day Eric says he just wants to be somebody. He wants to make a difference in the world, and improve the life of his family. Not many people in his family have had the opportunity to go to college, and Eric does not take this experience lightly. He understands the importance of higher education and is willing to do the work to make his dreams come true. To support any of these students achieve their dream and add to the scholarship fund that is already set up for them, please click on the link below and help us support their dreams of attending college.